The most remarkable number I have seen has Uber stating that 50% of rides in San Francisco are now UberPool. With UberPool, the system tries to find people with overlapping ride segments and quotes you a flat price for your ride. When you get it, there may already be somebody there, or your car may travel a small bit out of your way to pick up or drop somebody off. It's particularly good for airports, but is also working in cities. The prices are often extremely good. During a surge it might be a much more affordable alternative. It's often been observed that as you watch any road, you see a huge volume of empty seats go down it. Even partial filling all those empty seats would make our roads vastly more efficient and higher capacity, as well as greener. Indeed, the entire volume of most transit systems could probably be easily absorbed, and a great deal more, if those empty seats were filled. The strongest approach to date has been the hope that carpool lanes would encourage people to carpool. Sadly, this doesn't happen very much. Estimates suggest that only 10% of the cars in the carpool lane are "induced" carpools -- the rest are people like couples who already would have gone together. As such, many carpool lanes actually increase congestion rather than reducing it, because they create few induced carpools and take away road capacity. That's why many cities are switching to HOT lanes where solo drivers can pay to get access to excess carpool lane capacity, or allowing electric/PHEV vehicles into the carpool lane. Most carpool apps today have a focus on people who are employees of the same company. Companies have had tools to organize carpools for ages, and this works modestly well, but typically the carpools are semi-permanent -- the same group rides in together each day, sometimes trading off who drives. The companies provide incentives like cash and special parking. The subsidies can often include a very important one, the guaranteed ride back. Some of these apps say that when you want to leave, if they can't find a carpool going near your house, they will provide alternate transportation, such as transit tickets or a Taxi/Uber style ride. This gives people the confidence to carpool in with one dynamically assigned group, knowing they will never be stuck at the office with no way home. Independent carpool services can also offer such a guarantee by adding a cost to every ride, but it's easier for a company to do it. In fact, companies will often pay for the cost of the apps that do this, so that all the employees see is the car operating cost being shared among the poolers. What has not happened much today is the potential of the multi-leg carpool, where you ride in one car for part of the trip, and another car (or another mode) for another part. Of course changing cars or modes is annoying compared to door-to-door transportation, though it's the norm for transit riders. A multi-leg service has some similarities to the concepts of multi-leg robocar transit I outlined previously. In one vision, the actual carpool sticks to highways and arterial roads, and never deviates from the expected route of the driver or any of the poolers. Poolers get to the carpool by using some other means -- including a private Uber style ride -- and then join it for the highway portion. If they are not going to the same place as other poolers, they can also use such a ride at the other end, though having two transfers reduces the appeal a fair bit. In spite of the inconvenience of having to do a transfer, if the wait is short, it's better than the downsides of the driver or other poolers having to go far off the highway to handle a fellow pooler, and there can even be financial incentives to make things smooth. In the fast-transfer world, you want something like this, though you don't necessarily need a path to other roads. A rider brought in an Uber can be dropped off there, and in interchanges with a private collector lane, the car that drops the rider off can easily get back onto the regular road in the opposite direction. In the map is an intersection that already has all the ingredients needed for carpool transfer points -- collector lanes, long ramps and lots of spare space. Most intersections are not as adaptable as this one, but new and reconstructed intersections can be adapted in much less space. In addition, transfer points may be possible in the center median, if there is room, under bridges, through the installation of a staircase from the bridge. 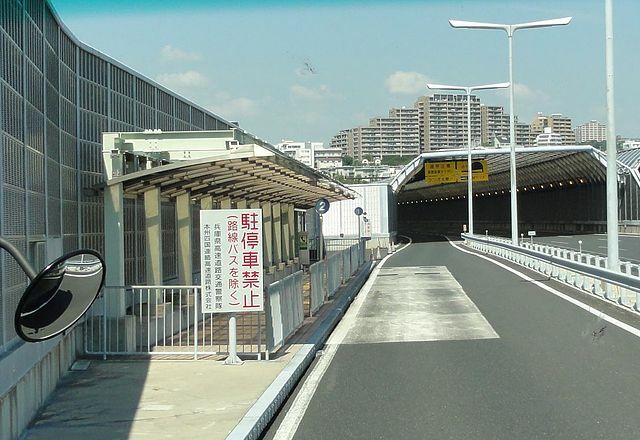 (If there is no elevator, the disabled can be brought to the transfer point through a longer route that goes on the highway.) This is a common layout for transit lines which run down the median. Full cloverleaf is better for the placement of transfer points, though there are other places they can go in other intersection designs. (It's become popular of late to replace full coverleaf intersections with the parclo design that comes from my home town of Toronto. This change is mostly done to avoid the complex merge and tight turns of a full cloverleaf, though robocars can handle the full clover just fine. You can easily put some transfer points in a parclo, you just have an extra minute or two spent by the stopping carpool. Transfer points are dirt cheap infrastructure, pretty much identical to bus stops, though ideally they would use angled parking so vehicles can come and go without blocking others. You do want space for a van or even a bus to come when you have found a super-carpool synergy, as will probably be the case at the peak of rush hour. Of course, if the volume of poolers grows very high, it justifies making larger transfer points and more of them. For super peak times, it's OK to use transfer points that are just off the highways (where parking lots to do this are plentiful) because with high volume, pools are making just one stop to pick up passengers and can handle a small detour. Of course, today the easiest way to do these carpools is with "carpool lots" not too far from the highway -- places with spare parking which allow carpool riders to drive to the lot to meet their carpool driver. Indeed, carpoolers should be those who own cars because the first goal is to take a car off the road that otherwise have driven, and the second goal is to fill the empty seat with somebody who would otherwise have been on transit. It can be difficult to get lots of parking convenient to the highway. One carpool lot I use has room for only about 50 cars. Nice that it's there, but it takes no more than 50 cars off the road. At scale, one could imagine it being worthwhile to have shuttles from parking lots to on-highway transfer points, though nobody likes having to do 3 or 4 legs for a trip unless it's zero wait time. If Robocars were not coming, one could imagine designing future highways with transfer points connected to parking lots. The people of the past did not imagine robocars or cell phone coordination of carpooling. If I was creating a start up to do car pooling I would certainly like the idea of some infrastructure to aide multi leg trips. From Uber's viewpoint, however, it might be the case that they have sufficient critical mass to offer door to door with little deviation from the original route. Maybe the infrastructure would be an enabler of competition? Regards the leg on major arterial roads, would this end up being provided by mass transport, though still possibly dynamic rather than scheduled? After writing this I guessed probably no, but see below. Optimum vehicle size for both single and multi leg pooling is hard to predict. The larger the vehicle the more time spent loading and unloading as well as more stop/start in the case of collection for multi leg. Additionally there is a reduction in frequency/flexibility the larger the vehicle. Against this is the greater efficiency of a full 10 seater vs that of a full 4 seater. My wild guess for the sweet spot is 4-6 passengers, based on very little but the above. The optimal size will depend indeed on demand, and the factors you name. At the periods of highest demand, it will be more efficient to have bigger vehicles for the common routes -- but only if you are not constantly starting and stopping to pick-up/drop-off as then you are just a bus rapid transit. It turns out there are some diminishing returns as you get bigger, not just because of the starts and stops, but because you have an incentive to use the big vehicle with fewer people because you have it already. Once you know exactly who is riding where, you send vehicles to match the demand, and you keep them more full. A 40 person bus with 40 people is more efficient than two 20 person vans for the same crowd, but the latter not only make fewer stops and do less road damage, they also adapt to lower demand times better. Bigger vehicles may use load square footage on the road, but their size makes them a bigger traffic obstruction, especially on city streets. They make it harder to change lanes and make turns, harder to see what's going on around you etc.